WASHINGTON, DC, March 24, 2017 (ENS) – The Under Secretary of State for Political Affairs has issued a Presidential permit to TransCanada Keystone Pipeline, authorizing the Canadian company to construct, connect, operate, and maintain pipeline facilities at the U.S.-Canadian border in Phillips County, Montana for the importation of crude oil from Canada’s tar sands. The permit reverses former President Barack Obama’s November 2015 decision to reject the pipeline. “America is now a global leader when it comes to taking serious action to fight climate change, and frankly, approving this project would have undercut that leadership,” Obama said then. 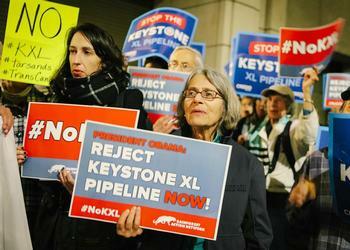 The Keystone XL permit was signed by Under Secretary of State for Political Affairs Thomas A. Shannon, Jr. The Trump Administration’s State Department is headed by former ExxonMobil CEO Rex Tillerson, who backs a permit for the pipeline. But Tillerson recused himself from the decision after environmental groups objected that it would be a conflict of interest for Tillerson to decide the pipeline’s fate. The Department of State reviewed TransCanada’s application in accordance with Executive Order 13337 of April 30, 2004, signed by President George W. Bush and President Donald Trump’s January 24, 2017 Presidential Memorandum Regarding Construction of the Keystone XL Pipeline. With this determination, needed for pipelines that cross international borders into the United States, the Trump Administration has overturned Obama’s decision that the pipeline is not in the U.S. national interest. The approval flies in the face of many years of public demonstrations against the pipeline, which would carry diluted bitumen, a thick black form of oil from the Canadian tar sands town of Hardisty, Alberta south 1,700 miles to Steele City, Nebraska. There it will connect with other pipelines to carry the diluted bitumen to Gulf Coast refineries. Girling says the timing of pipeline construction is not yet set. TransCanada must secure a route permit in Nebraska and acquire additional federal permits and authorizations. The $8 billion project still faces litigation over the route brought by Native American tribes, landowners and environmental group. Environmentalists who have fought the construction of this pipeline for years are again warning of disastrous consequences for the climate, for water sources and for wildlife. Keystone XL would carry up to 35 million gallons of oil every day from Canada’s tar sands — one of the dirtiest, most carbon-intensive energy sources in the world – to refineries in Texas. The 1,700-mile pipeline would cross rivers, streams and wetlands that are a source for drinking water for people and provide habitat for at least 20 rare and endangered species, including whooping cranes, pallid sturgeons, interior least terns and piping plovers. Since 1986, pipeline accidents have spilled an average of 76,000 barrels per year, or more than three million gallons of oil and other substances. The company emphasizes the jobs that will be created and the money that will flow into the U.S. economy from pipeline construction and operation. “The total estimated property tax from the proposed project in the first full year of operations would be about $55.6 million spread across 27 counties in three states,” TransCanada states on its website. Additionally, sales and use taxes revenue from the construction of the proposed project would be approximately $66 million. These revenues could help to ease the tax burden on ordinary Americans. 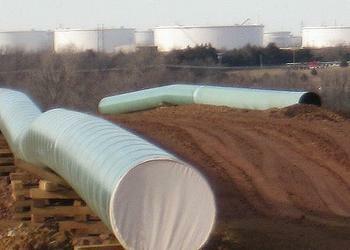 Construction of KXL is also expected to contribute approximately $3.4 billion to the U.S. GDP. But environmentalists warn that the planet is already dangerously overheating and burning the tar sands oil carried by the Keystone SL pipeline would worsen climate change.